In House & Home, My Life, Organizing. After I read The Life-Changing Magic of Tidying Up last fall, Will and I did a serious tidying up (read: massive decluttering). We got rid of dozens of bags of stuff, which is noteworthy because we’d just moved six months prior, and thought we’d already done a major purge. Marie Kondo convinced us we hadn’t been taking this tidying thing seriously. We are now: we were so happy with our own results that we turned our attention to tidying our four kids’ stuff. It’s important to remember that according to Kondo, “tidy” doesn’t mean “magazine quality” or “Pinterest perfect.” It means that you have what you need, and not a bunch of extra stuff you don’t need (or even like) cluttering up your home and your life. It’s about having a home that works, not one that is company-ready. Tidying up for kids has its special challenges, and this is the biggest: kids grow and change constantly. A core belief of the KonMari method is that tidying is not a daily chore: it’s a special event. But when kids are outgrowing clothes and shoes and toys and gear from one season to the next, that means a whole lot of decluttering, on a regular basis. It’s not easy, but it’s possible, and it’s worth it. The alternative is having to deal with a bunch of stuff you don’t need and might not even like, and nobody wants that. Today I’m sharing tips on getting started and staying tidy: some straight from Marie Kondo, some from my own experience, some gleaned from friends who’ve successfully tidied up with kids. I’d love to hear your own tips in comments. For kids under age 2 you’re the boss. It’s your job to organize their space and keep things tidy (even if they are able to “help” a bit as they near their second birthday). Model good organization: show your kids what “tidy” looks like, and how to get there. 3. SET GROUND RULES THAT MAKE SENSE. This will vary with your space and your household’s needs. Possible examples: no storage on the floor, no legos left out overnight, no piles left on the bed. Even preschoolers can put things away when everything has a place (although they’ll need reminders and encouragement until the habit is formed). Most kids—no matter how well-intentioned—can’t follow the command “clean your room”—it’s too big a task. Whether it’s a huge tidying up or daily maintenance, break the job into baby steps: the younger the child, the more steps they need. 5. START WITH FOLDING CLOTHES. Kondo’s advice for kids under 10: start with folding clothes. This is the best way for them to develop the habit of tidying their own space. 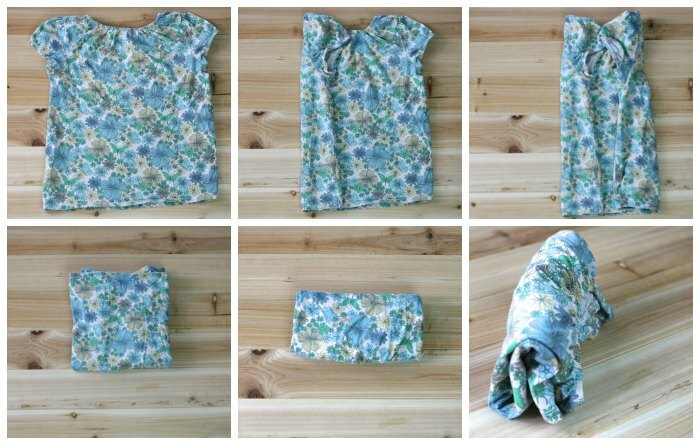 (My kids love KonMari folding—even the 5-year-old, but it does take practice.) The basic KonMari fold is shown above. Kondo recommends the following order: clothes, books, papers, miscellany, and then things with sentimental value. 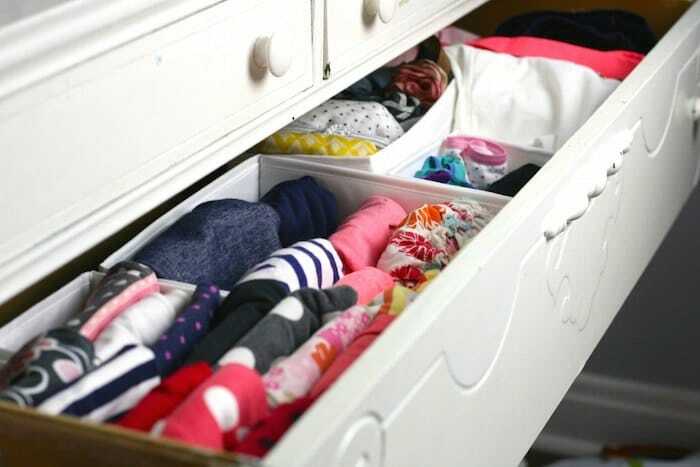 However, for kids (and adults with ADHD) she recommends organizing by smaller categories: don’t sort all the clothes at once, begin with the shirts. Don’t sort all the books, begin with only board books. 7. DOES IT SPARK JOY? 8. DOES IT SPARK COMFORT? This question isn’t from Marie Kondo: I made it up, because it helps me decide whether it’s worth storing all the baby and kid stuff we “might” need down the road. Do the boxes of hand-me-downs I’m storing in the basement spark joy? That wouldn’t be my first answer. But am I glad (happy, even) that as my kids grow we won’t have to buy them each new wardrobes? Absolutely. Making decisions out of fear is a big no-no in Kondo’s book, so make sure you’re keeping things for the right reasons. Do you cherish the thought of a potential new addition to the family happily peddling the family tricycle down the sidewalk? It’s a keeper. Are you done with it but afraid that you might need it some day? It would probably bring you more joy to give that trike to a family who can use it now. I think Marie Kondo would say “comfort,” properly defined, is the same as “joy.” But this change in semantics helps me clarify what baby and kid stuff is worth keeping, and what should be given away. 8. LIMIT THE SPACE FOR STORAGE. Abundant storage space isn’t necessarily a good thing: just because you can keep something doesn’t mean you should. Kids are easily overwhelmed by too much stuff: keep this in mind when you’re deciding what to hang onto and what to give away. 9. MAKE LETTING GO OF THINGS NORMAL AND NATURAL. Whether you’re doing a big purge or everyday maintenance, make letting go of things a normal and natural habit from an early age. 10. GET RID OF THINGS PROMPTLY. After a tidying up, finish the job. Don’t let those Goodwill bags linger; if you have hand-me-downs packed up for a friend, drop them off immediately. 11. DON’T KEEP THINGS THAT ARE BROKEN. This is a simple but oft-neglected ground rule. 12. LET KIDS APPRECIATE THE DIFFERENCE BETWEEN CLUTTERED AND UNCLUTTERED. There’s no better motivation for keeping things tidy. This is a huge argument for occasionally doing a large-scale decluttering. In the photo above, we moved everything (that weighed less than 100 pounds) off my boys’ floor and into the hallway so they could appreciate the difference. Then we carefully decided together what belonged in their room, what belonged elsewhere, and what should be given away. 13. YOUR TIDYING ISN’T GOING TO END. There is no one-and-done tidying up for parents: kids grow and change quickly, and so do their belongings. Frame your expectations accordingly and you’ll be much happier. 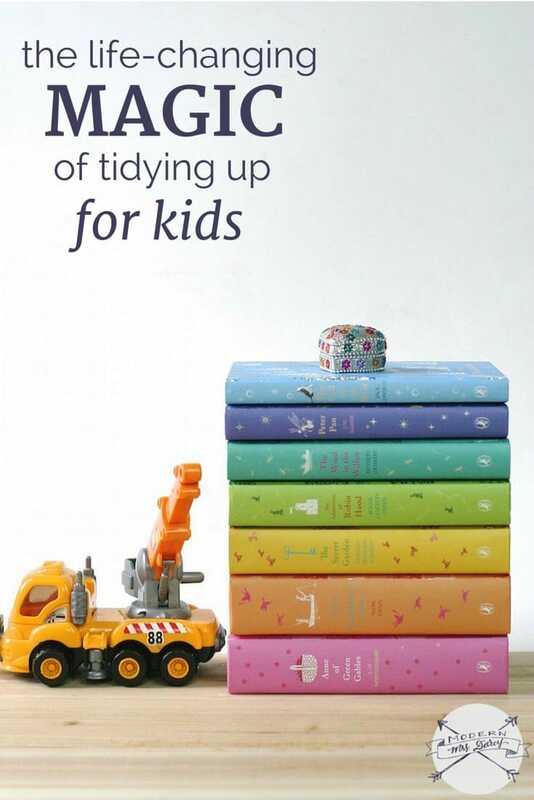 What are your best tips for tidying up with kids? What are your pain points? P.S. The 7 basic of tidying up according to Marie Kondo, and The Life Changing Magic of Tidying Up, six months later. Next:I took my 8-year-old to the tattoo parlor and here’s how it went. I started the KonMari methos on my kids’ closets after finishing mine. Each piece of clothing was touched and looked at and thought about and either carefully folded or hung up or put into the donation pile. We all loved the results. Then, a couple of days later I received the gift of a bag of hand me downs for my son. Each piece was gone through touched, thought about and either placed in the laundry pile or discarded in the donation pile. I was so discouraged when I realized he’d only kept 5 pieces. Then I realized that this was actually the goal. Why keep things that he’s never going to wear? I love this method, and it is changing the way we do life, but it’s still going to take time to change my thinking about the way I approach our belongings. It looks like my kids are far ahead of me in this aspect! Anne, I loved your reply to a commenter on the last konmari post – that it’s the combination of tough love and the mental shifts that make this book such a big deal. 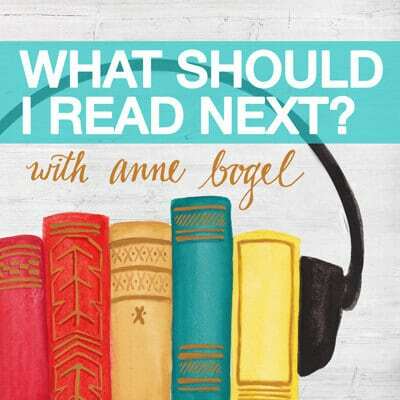 I plan to buy it on audio with my next audible credit and can’t wait to listen. I hope you enjoy it in that format—I’d love to hear what you think. I love that “spark joy” idea. I had to add “is it shabby?” to my list, as I have a habit of loving things past the point of their real usefulness. I’m wearing a pair of shoes right now that I’ve loved into shabbiness–but in a life-changing moment I’m only waiting on Zappos delivery until I can thank these shoes and put them out. Touching things and sparking joy have helped to clarify what to keep for my four kids as well. Love the crazy quirky KonMari method. “Is it shabby?” is a great question for the list. 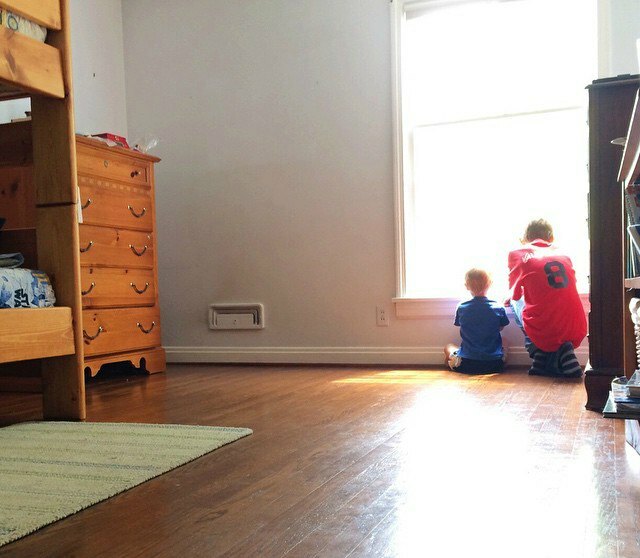 I think the biggest step for me was really letting go of what our sons were ready to get rid of — it’s very easy to get sentimental about stuff they are over. But if they are ready to get rid of it, let it go. A tough lesson for me but valuable. As they got older and would go through clothes, I would help them but the two things that made the most difference were 1) giving them a box for the clothes THEY were sentimental about and 2) setting the criteria as “tomorrow I am going to pick something out of your closet and you will wear it to school, no matter what.” When I put it that way, they were much more willing to actually look at every single piece instead of glancing in and saying “yeah I want all those shirts.” We were fortunate in having enough closet space that their t-shirts were all on hangers — just easier to do right out of the dryer since we had the space. They are just and about to be out of college — we are holding a dozen plastic bins for each of them until they get settled. Every couple of years, and before we moved recently, I told them we would store but that someday we would ship it all to them at their expense and they were not allowed to say “why did YOU keep that?” One son actually started to say that last time he went through a box and switched mid sentence to “if I don’t remember why I kept it, can I give it away?” Yay! After reading Kondo’s book (thank you for your recommendation), I tackled most of our home this spring, letting my grammar-school daughter know that her room was “on the list” when school was out for summer. Our little magpie was less than enthusiastic but when the time came she emptied her entire room except for hanging clothes and bedding. It took her four days (some time spent with me, some time spent by herself) to get back in what she truly wanted and needed and had a place for. We’re a month out now and even she agrees the process was worth it. It has changed the way she shops, too. Instead of trying to justify a spur of the moment purchase she is now thinking about whether the item will work with her other things (i.e., whether it sparks joy and whether she has a place for it). I’m so glad to hear that. Thanks for sharing how it played out in your family. This is so, so helpful as I finish up Kondo’s book and wonder how in the world to implement it in a household of 5-almost-6 kids who live, play and school at home! Thank you! Thanks for sharing your tips. My almost six year old is sentimental in this material world so early on I decided that we would hold bi-yearly “good-bye” sessions for her toys and books. The timing works well for late June (before birthday) and early December (before Christmas). We have instituted this so she’s come to expect the timing of letting go and receiving things. I’m not saying she’s pumped about it but I’m hopeful it’s a tool that she can use and tweak throughout her life. We do the same pre-birthday and pre-Christmas purge over here! Anne, I am SO glad you recommended this book. I just finished it a few days ago. We are moving back to the US soon after a stint overseas, and I can’t wait to see what I packed away into all of our boxes that are currently in storage! Like you, I thought I was purging at the time, but I know that there are many things left that are nice but that don’t “spark joy.” I am so glad to hear how effective this process has been for you and your family and look forward to putting her ideas into action soon. The way she folds clothes is typically the way many retail stores fold their clothes, minus the last fold. As a result of having worked at both Kohl’s and Macy’s I always fold my clothes this way. It is pretty easy actually, especially after you get so used to it you don’t have to lay each shirt flat to fold it! My mom trained us well when we were kids. Our rooms had to be “immaculate” ( her word) before we could leave the house. That meant bed made, all clothes in closets or drawers, closet door shut, all horizontal surfaces…bed, floor and dresser, free from toys or other items. We each had a small toy box in our rooms and shelves for books or other items. All of our shared toys and games were stored in a central location. This closet could be locked by mom for a day or two if she found it untidy. I started making my bed at age 4 and all these years later I get up and make it right away unless my husband is still there! Our rule is last one out makes the bed! We always had a time before Christmas when we sorted through toys and games in order to make room for new and also to donate unused things to someone who needed them. With so many cousins in our family , both older and younger, the clothes were regularly sorted and passed on. It was fun to get something I remembered my older cousins had worn that I admired. A Beatles sweatshirt was one that I recall. I was so excited to get my turn to wear it. You must have read my mind. 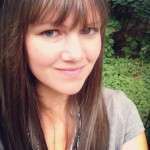 I have plans to tackle my youngest daughter’s (read: pack rat’s) room this afternoon. I always wonder how to handle de-cluttering for her because everything brings her joy. Even an old gum wrapper 🙂 She is a collector for sure. I will certainly be using some of these ideas when we dive in to her piles. oh! that’s my daughter too (age 6). She loves EVERYTHING, and even if she forgets about it when she doesn’t see it (and if I got rid of it secretly she’d never know), when we go through things, the thing she’s looking at is currently her favorite. 🙁 I have decluttered when she’s not around since she was young, but I want to start involving her more in the process. My daughter has a similar affliction, especially when it comes to books and stuffed animals! I have usually gone through her things when she is not around as well. This year we are starting a new rule that I probably should have started years ago but she and I both have ADHD, I can think of a great idea and then either forget about it or not follow through. But this year she and my husband and I wrote out a little “contract” and signed it and it hangs on the fridge for all to see and remember. The three of us have our birthdays right around Christmas, I liked another gal’s comment about just before birthday and just before Christmas, I’ll have to adjust the wording but we may have to add a 2x/yr to our contract. LOVE this post and couldn’t agree more about including your kids in the process from an early age. We did a huge clear out recently with our kids stuff and talked to them about the importance of “needs” and “wants” and about giving to others in need. Also we included a small motivation/reward system – for every kilo donated they got a sticker for their sticker album collection (they ended up with about 20/25 stickers each). They loved weighing their stuff and “trading it in” for stickers. Love your thoughts about kids and clutter, but found it interesting you didn’t bring up toys as a separate category. This is my biggest hurdle with kid clutter right now. I don’t feel like we have a lot of toys, I’ve already done a major purge and knocked it down to just the things that get played with regularly. The big question for me is, do we keep it if it brings joy to my son even if it drives me crazy? Some days I just want to throw every single toy out because I hate the battle of getting him to clean up after he’s spread them all over the house. He’s still pretty young (3), but I feel like toy clutter will only get worse as we have more kids, even as we try to be minimalist about it. 1. First, figure out a specific “home” for every single toy. I worked in a large day care center before we had children, and this principle was one of the valuable things I learned — kids can’t clean up if they don’t know where an item “goes,” but if every item has a home, the youngest of walking children can learn to put them away. And just like in most day care centers, we preferred shelf and bin storage to big toy boxes — much easier to select things to play with without dumping everything out. 2. Make toy clean-up as regular a part of the day as wiping face/hands after eating. The frequency is up to you. In our household, toys were picked up before lunch or just after lunch and before stories/naps, before Daddy got home from work, and before evening going-to-bed routine. If we were headed out somewhere, I tried to include a quick toy pickup before we left. When they were 1-4 or 5, I did it with them. As they grew, they could do it themselves. If there was an extra-big mess because of friends coming over to play or whatever, I helped. 3. When more kids began to equal more toys, every few months while they were napping I’d box up about half of the not-played-with-every-single-day-but-still-enjoyed items and put them away. A few months later, I’d bring those out and box up the other half. That ALWAYS re-energized the kids — it was like having new things. Note that I NEVER boxed up Playmobil, Lego, favorite dolls/stuffed animals, or so on. These are great, thanks Lori! Yes, these are great! I love the suggestion about making toy pick-up a more regular part of the day. Right now we only do it once, in the evening before bed. But that means I spend all day in a sea of toy clutter, and it drives me crazy. I’m going to try forcing clean-up more frequently, at least once during the day too. I’m glad you find my ideas useful. Basically, I chose our clean-up times because they occurred naturally before a happily-anticipated activity — reading stories or eating or going somewhere — AND they came before a period of time in which the space could STAY tidy so I could enjoy it for a bit — during naptime or having it nice for Daddy’s homecoming or when we came back downstairs for grownup time or when we came home tired from somewhere and it was good to be greeted by a neat house. It was a win-win for helping the kids participate with minimal grumbling and maximum speed and also for helping me have some visual peace. The principles for toys are the same, and these are her most important ones: set ground rules that make sense (for YOU as well as your child). Purge as necessary. Limit the space for storage (this is a big one: some families keep a small toy collection; others go on a toy rotation/library system). Designate the ONE place that every toy belongs. The Design Mom book about living with kids also has good tips about managing toys. My girls’ stuff has been the hardest for me to tackle- what brings them joy sometimes looks like clutter and junk to me and so I’m having to set up back and re-evaluate how and why to declutter their spaces. I’m not sentimental about stuff and our house is small, so purging is something I’ve never had a problem with. And with kids, it happens multiple times a year, to move out outgrown clothes or sports gear or to get rid of some of the junk they seem to accumulate–junky prizes from school, crap from goodie bags, etc. The clothes folding kills me. How does this work when you have a wardrobe that consists of mostly black clothes? Folding all my black clothes would require me unfolding them to figure out which was the one I wanted. And the kids, they don’t have enough clothes to even fill a drawer like the one in the pictures. Their stuff gets a cursory fold and tossed into the drawer. I guess it would bother some people but not doesn’t bother me and the kids can always find what they want. I can’t wait until the library lets me know it’s my turn to read this book! ooh….perfect timing! I’m in the middle of reading this book and had gone through my clothes and books. The kid’s toys, though, were really a sore spot and a constant messy headache. I’m not a naturally neat person but I also can’t handle messiness. 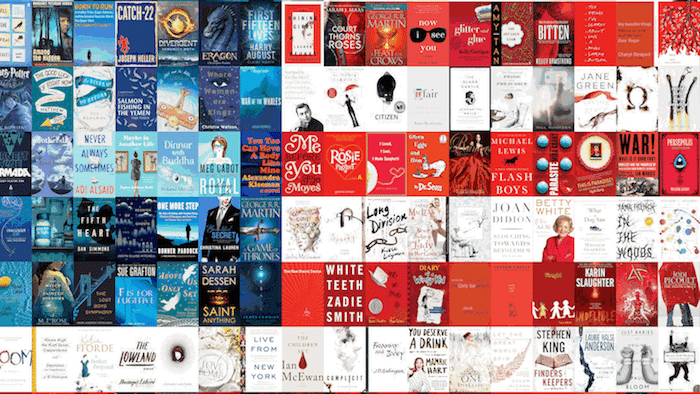 I skipped through to the end of the book and was dismayed to find there wasn’t a section about toys–I only found a comment by Marie Kondo on the internet where she said that she found that Japanese and Americans are similar in terms of their challenges with stuff with the exception that Americans are completely overwhelmed by toys. So I decided to give it a try anyway. I hauled out all of the toys and put them in the family room. They covered every inch of floor and furniture. I gave my kids a limit to one bookshelf with 4 cubbies for toys and one buffet for puzzles and games. Over the course of a few days we sorted and they chose their favorite things. I had to keep my mouth shut a few times–they only wanted to keep a few pieces of sets of some playmobiles, little pet shop, etc. But then I realized that it didn’t matter if they didn’t keep every single piece. The point is to just keep their favorites. It’s only been a few days and is awesome so far. Because they only have toys they love there is much more playing and much less asking for tv. Love your other points–will be implementing those too. I like how you describe yourself as someone who is not a naturally neat person but still can’t handle messiness. That’s exactly how I feel! Also, Playmobil sets are a problem. I wouldn’t want to see them get split up because they’re so perfect, but they are also taking up all of the allotted space in the kids’ closets. They did get rid of ALL their legos at once, which really shocked me. Did your husband read the book, too? Or did you read it and then get him on board? Just curious about the dynamic. Occasionally I’ll get inspired to try something, but my husband is definitely a “Questioner” on the Gretchen Rubin tendencies chart and can be somewhat skeptical of my “let’s change how we do things” approach! 🙂 Did you pass the book on to your husband? Have him read key parts? Or just explain what you’d read and why you wanted to try it? He didn’t read it, and I didn’t really explain much to him. He just watched me purge my closet and joined right in. I have given him a few tips but I’ve refrained from repeating “Marie Kondo says … ” like a broken record. Usually in January, right after Christmas and two birthdays, we have a purge session. This past year was the first time I held up each doll, stuffed animal, and piece of doll clothing separately and asked, “Does this give you joy?” I was amazed at how saying, “Do you want this?” resulted in hemming and hawing, but “Does it give you joy?” was often answered with a quick ‘no.’ I had to watch all their legos and some of my old toys go out the door, but it was good. Two days ago I sent them on a plane to see my family. They each took a stuffed animal to hug on the overnight flight, a deck of cards, and a Kindle, proving that they can leave all their toys for a month without blinking. Perhaps it’s time for another purge! Breaking up a big job into smaller ones is key for me. I tend to get very overwhelmed when I look at my kids’ room! I’m loving all of your posts about Marie Kondo’s book. I too read it (based on your recommendation) and immediately re-folded all the clothes in our drawers. I was amazed at how much less room clothes took up folded the Marie Kondo way. I was a little apprehensive about tackling our toy situation, partly because Kondo didn’t really address how to deal with toys and partly because my kids can get attached to certain play things. I got my answer on how to proceed with toys though on a recent vacation. The only things we took for our kids (ages 5 and 3) to play with at our beach condo rental were games (UNO, Trouble, Checkers, and Connect 4) and craft supplies (markers, paper, crayons, and scissors). It may sound like a lot but everything fit neatly into one medium-sized bag. They went through the whole week and never asked for one of their toys at home and never complained about only having games and craft supplies. My 3 year-old’s drawing skills greatly improved and I loved that they sat together and created things the whole week we were gone. I kept thinking how much more content they seemed (and our family as a whole seemed without the trappings of our stuff at home) and longed to recreate that atmosphere when we got back from vacation. I just finished going through each of their toys and my kids did surprisingly well. There were several items they weren’t willing to part with but we were able to fill up a large bag full of gently used toys to donate. It was a win-win: I got to clean out their unnecessary toys and they got the satisfaction of cleaning their space and giving to other kids. Again, I’m really enjoying your posts on organizing (and really everything for that matter) and look forward to more of the same content. I have to say reading Step #3 : no legos left out overnight, is very different at my house. We have a spot for Lego creations. It’s on the living room floor. The loose legos must be put back in the box, but not the built or partially built ones. The reason I leave this ‘mess’ is creativity. Having a time limit on creativity (dinner or bedtime) would impair me, so I choose not to force that on my family. This applies to art being created, blocks being turned into cities, paper being made into towns, etc. As long as the supplies are picked up, the creative work in progress can stay. We don’t have a large space, but this is an area that I’m insistent on. We store our legos in a big under-the-bed tote, big enough to spread everything out and find the piece your looking for, but still contained. We live in a tiny little townhouse with 3 (soon to be 4) very active boys, so we need open space! I was inspired by minimalism and decluttered bigtime when we were expecting #3, and I’m so glad I did; it makes life so much easier now. My best tip is to monitor carefully what comes into your house. We are very selective about what we bring home, even if it was free, even if it brings momentary pleasure. Is there a place for it? Will it continue to be useful/fun/treasured beyond today? Or will it be shoved in a drawer and forgotten? I also have no qualms about throwing stuff away. My children recently brought home one map each from a botanical garden that we visited, and they loved those maps… for about 3 days. As soon as they started to leave them lying around and rip them, I sent them straight to the recycling bin. 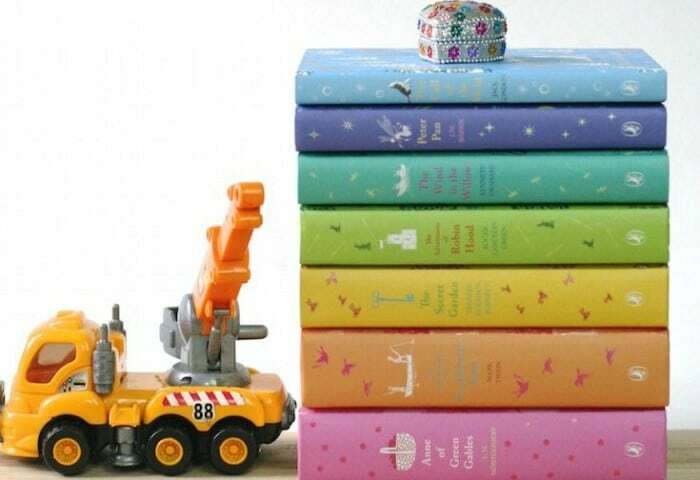 Those beautifully colorful books bring me joy. 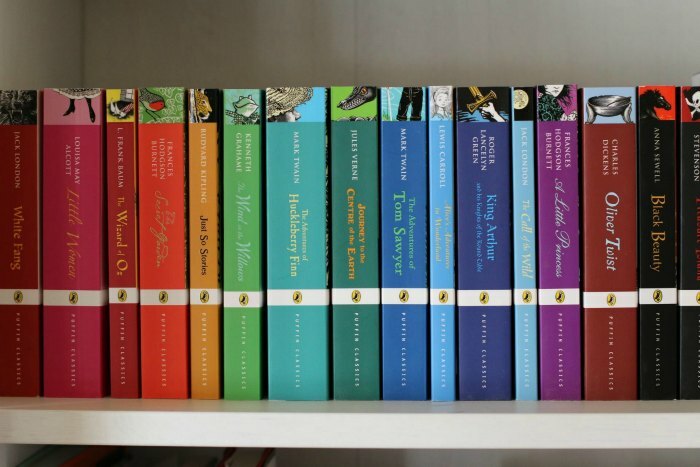 Where did you get (or who publishes) the ones standing up on the shelf and the ones horizontally? They’re Puffin classics (paperbacks on the left) and Puffin Young Readers editions (hardbacks on the right). Thank you! I was just scrolling down to see if someone asked this exact question! I love this post! I really enjoyed the book but had a hard time seeing how some of her principles would apply to kids simply because they DO grow and change so quickly. And, they are given things by grandparents, at birthdays, etc, so tidying has to be a repeated activity. I definitely think the “one in, one out” rule also really helps us with our kids. It makes them really consider buying that toy with their birthday money or bringing home that trinket from grandma’s house because they will have to replace something they already own. We also do a regular decluttering before Christmas which helps motivate them to give away things they no longer use or love. The one thing I haven’t been able to embrace yet is the folding method, our kids clothes are currently in baskets b/c of limited space. But we are moving and I’m thinking I might try the folding method in the new place. Thanks for your words! I tried to encourage my kids to think of the objects as sentient beings (odd as that may sound). My son had a whole bed full of stuffed animals and when I told him we were going to declutter them he said, “NOOO! BUT I LOVE THEM ALL!” Still, we picked them up one at a time and I asked him, “Does this spark joy? Do you really love this? If not, then it’s not fair for it to be here with you when it could be in a home with a child who really loves it. If you’re not going to love it and play with it, it’s time to let it go.” It really seemed to change the way he thought of the whole process. I encouraged him to hug each toy and tell it thank you and wish it luck in its new home. Definitely made the process easier, and by the time we were done we had a full kitchen-sized trash bag full! I read *somewhere* that ‘joy’ can also be interpreted as ‘gratitude’… joy isn’t about a burst of excitement (when I’m looking at my toothbrush, for example, I am not giddy with ‘joy’), but about a deeply felt sense of thankfulness (I am so thankful for the dental health my toothbrush brings me). Approaching with a sense of joyful gratitude has actually made it easier for that last push of purging! I’ve never heard it explicitly stated that joy=gratitude but that sounds perfect to me. Thanks for framing it for me. Ive been searching for some feedback in regards to storing childrens belongings, backpacks, shoes, items that they bring in when they come back from school. Im just wondering your opinion on a mudroom. It seems like Marie Kondo suggests storing all like items together that means all childrens items in their bedroom and not using a mudroom catch all? I found this post on Pinterest. I am just starting to read the book, but I am very interested in figuring out how this would work with kids. Discarding and organizing my things seems do-able. I am hoping that seeing my things clean will inspire my husband. The kids on the other hand, I am not so sure about. I was doing a different cleaning method earlier this summer and I asked my girls to choose their 10 favorite stuffed animals to keep and that we would box away the rest and if they didn’t miss them we would give them to someone else after whatever time. I thought that 10 stuffed animals was very generous and my oldest daughter who is 10, doesn’t hardly even look at stuffed animals anymore, but when I told her about this she broke down crying frantically. When I looked at some of the stuffed animals with her she would clutch onto stuffed animals whose stitching was even coming apart. Nothing particularly sentimental about it I don’t think. When I asked her why she loved it so much, it was because it was “hers”. Mind you she has a huge mountain of stuffed animals and that is only one division of toys she has! The other two children had similar reactions. Did you have to conquer anything like that? Sorry for such a long comment. I don’t have a solution to offer, just some sympathy. Sounds like you have quite a challenge on your hands. Maybe ask about packing away to rotate so they can really love their toys and have space to play — and just don’t mention the possible give away part? My sons were fanatic about a few things and they started to let go recently (when they got to college, which I realize is not the most hopeful you could hear). Let’s hope someone else has some good ideas! 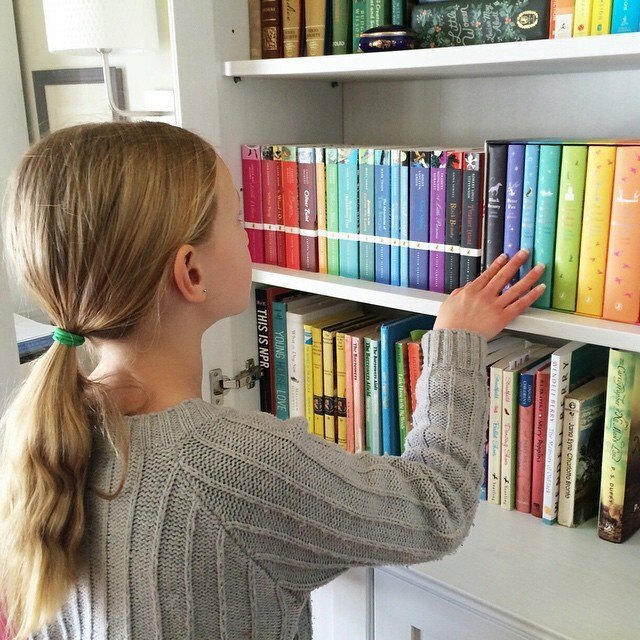 I realize this is beside the point of this wonderful article, but can you share where the beautiful rainbow book sets are from?! The one with Oliver Twist? My son is coming up on reading age and those books are gorgeous! Of course! Those are paperback Puffin classics. I have a 9yo boy and an almost 4yo girl. After reading The Life-changing Magic last January, I started on the house right away, but have put off dealing with the toys….still. My son, then 8, and I tackled his room last March. I know Kondo says to not do the process by room, but we treated his room as his “house” and went through everything by category. The hardest thing for him was learning and internalizing that it is all right to get rid of something that doesn’t bring him joy – even if it was a gift. It went a LOT better than I ever expected and I’ve only had to say “go clean your room” three times since then! My 3yo and I haven’t completed her room yet but we did do her clothes with great success. One thing that surprised me was how cognizant and opinionated she was about her clothes, even at such a young age. Her comments were regarding the feel of the clothes rather than the designs on the front. She informed me that she didn’t like how several items felt on her because they were itchy, tight, etc. As the mama, it was a little difficult at times to let go of certain items, but I decided that if she was aware enough to let me know something was uncomfortable, then I should honor her decisions. One way we’re tackling daily clutter is by having one of the kids’ daily chore categories be to “put away adventurous hikers.” I’ve taught the kids that all of their things (toys, shoes, books, etc.) have “homes” where they like to sleep when they’re not being used. The items like to be in their homes because they’re with their friends there. If things get used during the day and are not put away right away again, they are called “adventurous hikers” (a term my 9yo and I collaborated on). Before we begin the bedtime routine, the last chore list item they have to complete is getting all adventurous hikers back to their homes. Doing cleanup this way has actually led to more things being put away throughout the day because when we first started this practice, they didn’t like feeling overwhelmed by the huge mass of adventurous hikers to be put away every night. When I read this book, it helped me and my husband a lot, however my main takeaway was “this lady doesn’t have kids!” I don’t remember her addressing them much so I felt like it wouldn’t work for my daughter. I’m glad for your tips. Now I feel confident to tackle her stuff with her. Thank you!! Thank you for this!!! I LOVED reading the book, but found it pretty hard to implement. I got rid of a bath robe that didn’t necessarily spark “true joy,” but then winter came, and I was COLD! It is even harder to help my children through this decluttering! I felt like I was left without a paddle because Marie Kondo did not mention how to approach it with children. I mean, we did have the girls sort their clothes and books, but my second daughter is extremely sentimental, and keeps things even that she never wears… or she wants to give it to “someone that we know.” –Which is one of the no-nos! And when we say “thank you” to an item and throw it away, she gets tears in her eyes! Eeeek! #12–SOOOOOOOOOO smart! Just to let them see the difference! I am doing that ASAP. Our children’s room is crazy! With my 9 yo daughter when I would ask her to clean her room she would get very overwhelmed about cleaning it because of how big the mess was. So what I did was make a list of all the types of items (stuffed animals, art supplies, barbies etc) to clean up, cut the list into straps of paper, folded them up and put them in a container. She would then pick one of the folded straps of paper and clean up what was listed. It made the cleaning up more fun. I would also help sometimes too.